Manama, Feb. 12 (BNA): His Royal Highness Prince Salman bin Hamad Al Khalifa, Crown Prince, Deputy Supreme Commander and First Deputy Prime Minister today met a delegation from the Middle East Policy Council, at Gudaibiya Palace. HRH the Crown Prince and the Middle East Policy Council delegation discussed a range of regional and international issues and reviewed the organisation’s work, which focuses on areas of shared strategic interest between the United States and the Middle East. 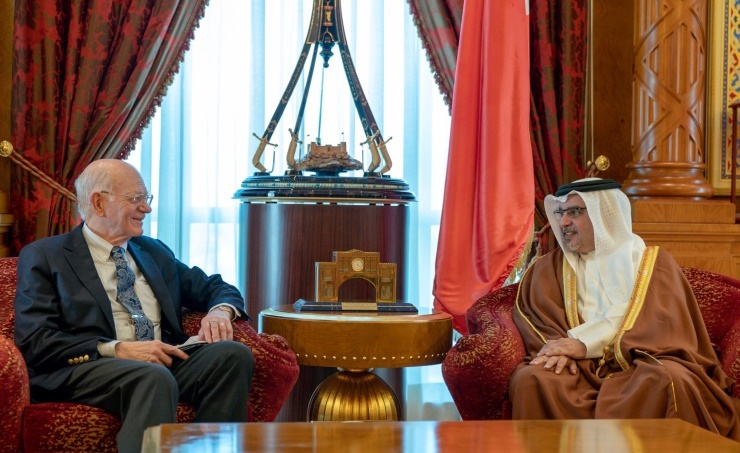 HRH the Crown Prince highlighted that the long-standing partnership between the US and Bahrain has played a central role in upholding regional peace and stability. HRH the Crown Prince also highlighted Bahrain’s long-standing efforts in advancing sustainable development, under the comprehensive development programme of His Majesty King Hamad, and stressed that the principles of mutual respect and coexistence continue to drive every aspect of Bahrain’s efforts to secure a prosperous and stable future for the citizens and the peoples of the region. His Excellency Shaikh Salman bin Khalifa Al Khalifa, the Minister of Finance and National Economy, also attended the meeting.